TALLAHASSEE, Fla. – The Florida Department of Highway Safety and Motor Vehicles (DHSMV) and its division of the Florida Highway Patrol are recognizing Hit and Run Awareness Month this February and reminding all motorists to Stay at the Scene when involved in a crash. In partnership with the Florida Police Chiefs Association, Florida Sheriffs Association and Florida Association of Crime Stoppers, the initiative seeks to reduce the number of hit and run crashes in Florida and encourage individuals to anonymously report information to solve hit and run investigations. Since 2014, in a quarter of all crashes every year, a driver leaves the scene. In 2017, there were 98,225 hit and run crashes in Florida with 177 fatalities. Under Florida law, a driver must stop immediately at the scene of a crash on public or private property that results in injury or death. Leaving the scene of a crash is a felony and a driver, when convicted, will have their license revoked for at least three years and can be sentenced to a mandatory minimum of four years in prison. Vulnerable road users, like bicyclists and pedestrians, are particularly at risk in hit and run crashes. In fact, of the 177 hit and run fatalities in 2017, more than 100 cases involved pedestrians and bicycles. During that same period, 95 percent of all hit and run charges were in-state drivers and 70 percent of all hit and run charges were issued to men. The most important thing a driver can do when they are involved in a crash is to Stay at the Scene and call for help. The public is encouraged to report hit and run crashes by dialing *FHP (*347). 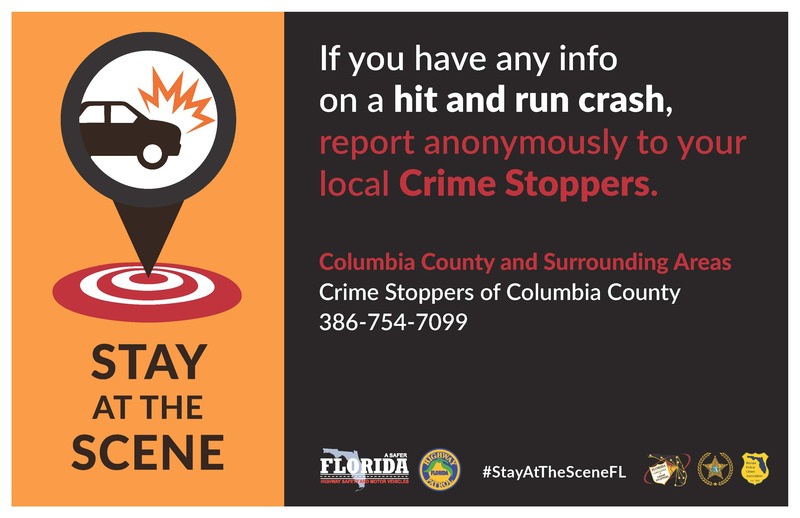 For more information on hit and runs and staying at the scene, visit: flhsmv.gov/stayatthescene. Please see the department’s website for a full list of active hit and run cases by county. Throughout the month of February, DHSMV will be highlighting local, active hit and run cases in an effort to solve these crimes. If the public has any information on these open cases, please contact Crime Stoppers immediately. Even small tips can make a big difference.